The River Thames is the second longest river in the UK. It is the most well-known of Britain’s rivers because it flows through central London. It also flows through (or really close by) some other important towns and cities in England, such as: Richmond, Kingston upon Thames, Windsor, Henley-on-Thames, Oxford and Reading. The Thames is tidal when it flows through London. More than 80 islands are contained in the River Thames. These include: the Isle of Sheppey, Canvey Island and Rose Isle. The Celts referred to the Thames as Tamesas (or Tamesis), which meant ‘dark’. About two thirds of London’s drinking water comes from the Thames. The River Thames has several tributaries, including: the River Churn, Windrush, Cherwell, Thame, Loddon and Mole. Several rivers also join the Thames after it has become tidal. These include: the River Brent, Effra, Westbourne and Fleet. The Thames becomes tidal below Teddington Lock. This is just over 50 miles from the Thames Estuary (and the river’s mouth). The Thames is the home to many different types of creatures. Lots of birds can be found at different points along the course of the Thames from source to mouth (such as herons, moorhens, grebes, kingfishers and coots). The Thames supports lots of different fish species too, including: trout, chub, roach, pike and many more. John Burns (a Battersea MP) famously described the Thames as ‘liquid history’. He meant that River Thames was responsible for supporting settlements upon its banks throught British history, from Neolithic times to today. The Thames has witnessed the birth of London and many of the key events in Britain’s history. The Thames has been bridged more than 200 times and it has been tunneled under more than 15 times. Many of today’s bridges have been built on the site of much earlier crossing points. 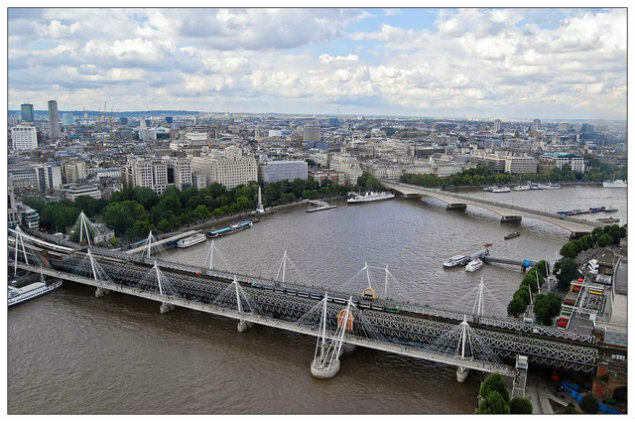 Check out our other fact files on important rivers by clicking here or discover more London facts by visiting our London resources page. yes it helped me to. we had to do a river leaflet/booklet for homework I found this website so helpful. Glad we were able to help you out, Rachel. it helped me with my homework. My teacher was very pleased with the work that i produced! Thankyou. It really helped with my homework….A* here I come. 47/50. Thankyou so much. I love this website its amazing and fun to read because I left my home work to the last minute as usual and did not no any thing about the river Thames so I found this website and it really helped me. because I have to go back to school on Tuesday. This amazing website helped me with my facts and homework. Ihave learnt alot from this website. Some of these facts I never knew. P.S THANK YOU! Thanks, Kai. I’m glad Primary Facts helped you with your homework. Please stop by again next time you need some facts or information. Thanks FOR THE USEFULL WEBSITE. Cheers Damarnie. Glad we were able to help you out with your homework. Please visit Primary Facts again soon. Thanks, Ashley. I’m pleased you found this post useful. Please visit again! this really helped me with my homework!!!!!! It’s great I thought I was rubbish at homework, now I am getting ticks all over my paper. thanks all facts needed to do poster on thames thanksssssssssss! Thank you so much i had my homework to do for geography and this was a great help!! 😉 §ank u! Awesome!! Awesome facts! Nice presentation. Helped me with homework. It’s my last minute homework. I didn’t get scolded. Yay! 😉 Thanks! Great website. Well done in your exam! Glad we were able to help. Great it really helped me with my homework. Thank you! Thanks, Brianna! Glad we were able to help you out. No problem! Thanks for visiting Primary Facts. That helped me with my homework i really like this site. hi this really helped me on my homework , thanks . found this website super good to do my homework and im in year 8. OMG!This is the best website to help you do your HOMEWORK with.It only took me 10 minutes to complete my HOMEWORK!!!!! This is like the best website everrrr!!!! Helped me with my homework and made me star of the week!!! Thanks. U helped me out! Thank you !!! This has helped me get a good grade on my homework assignment. I appreciate it a lot, and it is a very good site.